The perfect Thanksgiving Dessert; Cupcakes and Cake Balls! 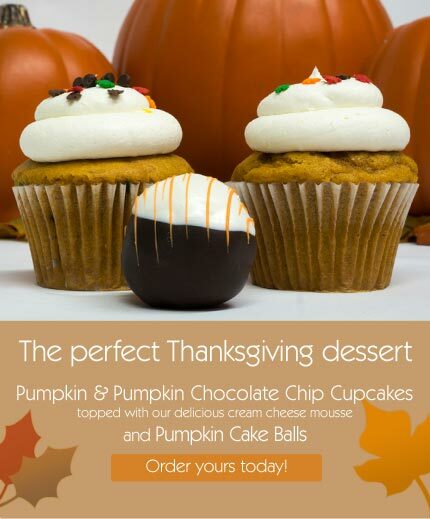 Call us today to order pumpkin cupcakes and cake balls to share with you friends and family on Thanksgiving! Best friend surprised me with cupcakes from Patty’s Cakes. Had dinner with girlfriends and the cupcakes were the perfect treat for the end of birthday meal. All five of us were delighted with our choices – chocolate caramel salty, chocolate w/peanut butter mousse and lemon colada. I had the lemon and it was light and refreshing. Moist. Sweetness level was just right. Look forward to trying more from this little gem! [Review] Loved this place and will be back again! Story: It was my baby-daddy’s birthday, and I was in need of a cake. Of course I waited to the last minute, day of his bday and still had no cake. So I googled bakeries in my area and landed on this baby! I couldn’t get a cake, bc they make them all fresh to order (awesome, but not for my time-crunch), so I got cupcakes! Probably much better than my cake search anyways! I got Red Velvet with Cream Cheese Mousse, Chocolate with Chocolate Fudge, and White with Vanilla Mousse. All my favorite flavors! Of course I had one of each flavor (maybe 2 of each…) and each one was so delicious! The frosting was not too sweet but still hit the sweet spot. And I saw the cake balls which are almost the size of a baseball! They were huge! Loved this place and will be back again! [Review] The cupcakes are so delicious! My sister got some of these cupcakes for my nephews birthday and everyone loved them. The cupcakes are so delicious! I’m a huge Elvis fan and they actually have an Elvis Cupcake with bacon on it, and it was soooo good.They even have a really good chocolate cupcake that has crumbled chips on top. I love all the different and unique flavors. Definitely going here again and I recommend them to everyone. [Review] Father’s Birthday Cake, Late Notice! I had to pick up a cake for my father’s birthday. It was really late notice and the very kind lady on the phone was able to make time for the same day pick up. Let me just say, the cake was the best cake I can remember me eating. Everyone in the family loved it! The staff was very friendly and this place does quality work. I would definitely order more cakes from here anytime. I for sure recommend this place!! Lovely cupcakes…delicious cake balls….the S’More is sooo goood…rich & s’morey & only $3 for the cake balls & cupcakes. I think this is the best prices for cupcakes I’ve seen. I’ve had the Salty Caramel & will now try the Chocolate Fudge w/ white cake…I love that you can choose white or chocolate cake. I also love that you get a FREE cupcake when you write a review…AWESOME!!! 06/16/2012 - Elizabeth - Fullerton, CA - via Yahoo! You will not find a better cake or service. Everything is always FRESH! No frozen cake here!!! Everyone raved about our cake. I have had a lot of wedding cakes and Patty’s are always the best and most beautiful. I wanted something unique in taste, modern in look and that did not break the bank and they delivered!!! I look forward to ordering a smaller version on our anniversary each year! Thanks to Philip and Patty for making our wedding beautiful and delicious! One word: Delicious!! My sister in law used Patty’s cakes for her wedding, and as soon as I tried her cake I knew she had to make mine too. Her cake is so moist and tasty, not dry like a lot of wedding cakes. PAtty and her son are such great people. They are always helpful and did a great job with the design of my cake too. Loved everything about her and cannot recommend her enough. Best wedding cake I have ever tasted, by far! Amazing and friendly service, EVERY TIME! Bethany is so sweet and patient. N the cupcakes are Allways amazing! I’m addicted! I recommend to everyone! Reasonably priced for the amazing quality. The cupcakes are really good. they taste like bakery style cupcakes. The banana one was my favorite! it has a great tasting custard on top of it that brings out all the flavors of the banana bread and cupcake.